Powers/Abilities: Able to create volcanos. Immune to heat and flame. Giant, at least sixty feet tall. Carries a rock-hammer for undisclosed purposes. Able to move through the underworld "with the speed of light". History: Discovering an entrance to a subterranean world inside a volcanic crater near Las Palmas, Mexico, geologist Bob Roland and his fiancee Carol started to explore. They were soon captured by strange beings "clad in asbestos suits", who took them to their leader, a giant man with flames running up and down his body. 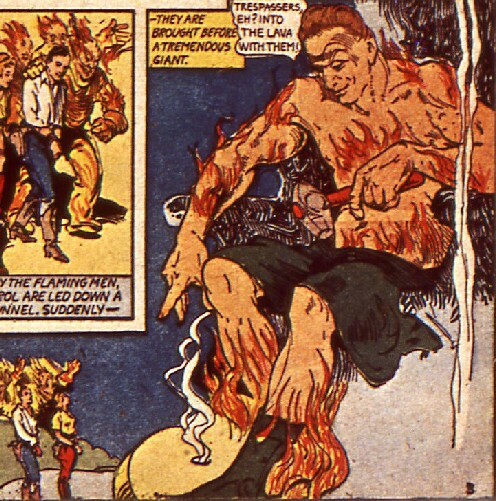 Initially this figure ordered them thrown into the lava as punishment for trespassing, but when they protested, he agreed to at least explain who he was. He stated he was "the Sub-Earth Man, God of the Middle Earth." Claiming he ruled the world "when the Earth was a fiery planet" but that his power diminished as the Earth cooled, he then told them of his intention to create volcanos and earthquakes until mankind was driven from the face of the Earth, leaving him in charge once more. Comments: At one point during the story, while Bob is telling Sub-Earth Man where to set off his volcano, the human states that he has "directed Volcan to a spot beneath the ocean". Sub-Earth Man never actually told him this name (at least, not on panel), so this might be his real name, or it might be Bob, a geologist, giving him a nickname inspired by Vulcan, the Roman god of fire.